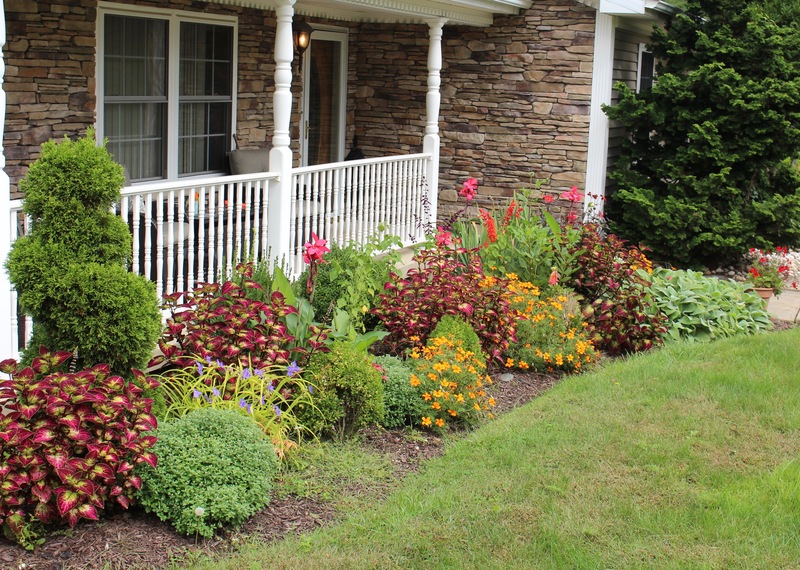 This entry was posted in annuals, deck plantings, fall, foliage, overwintering tropicals, Uncategorized and tagged abelmoschatus, all season annuals, growing annuals, pennsylvania garden. Well, well – your secret is out; you are a fantastic gardener! If you’ve created all this annual planting to take you over the autumn dull time, I admire it all! Well done. 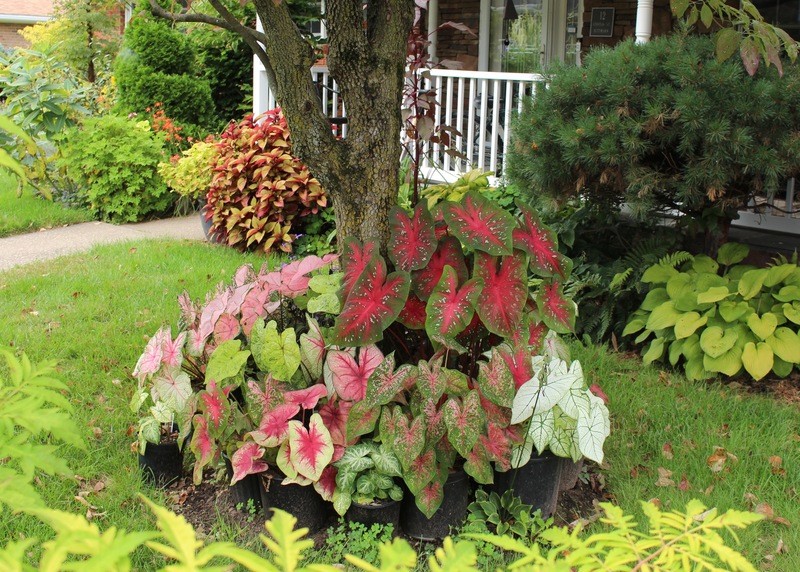 I especially loved the caladiums and all the planting on the terrace. Thanks Christine. I hope you’re able to give the caladiums a try next summer. They’ll love the shadier parts of your terrace and as long as you can keep them well watered they should thrive in your heat. It’s been gloomy here for several days and not even the annuals are helping. Please send some sunshine if you can! 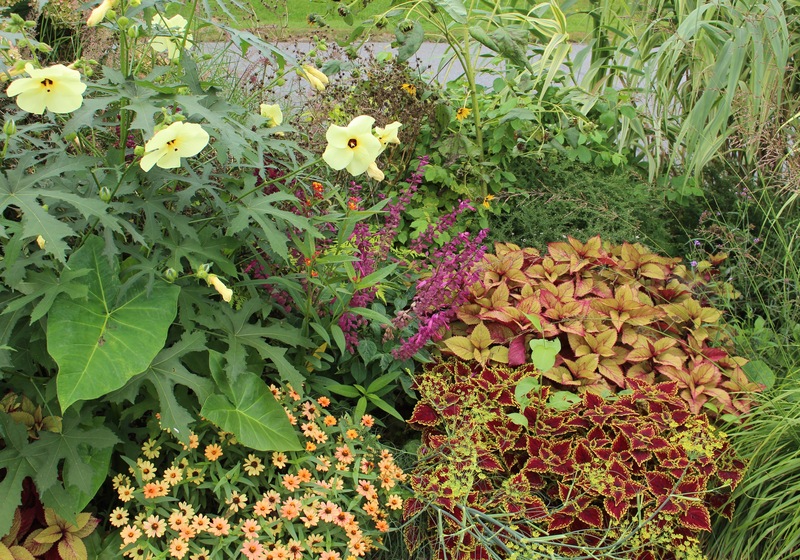 Annuals are our allies in the garden. They fill in and and then fill out all those empty spaces with non stop color. Your array of annuals are spectacular. Especially that tropical area. I just don’t like having to bring in anything. I am paring down to about 7 plants. I doubt anything will get accomplished in the garden this fall. It is too darned hot. I will have to wait until next spring to do much clean up. Of course if it ever gets cool here I might do some clean up. I love the deadly Datura. The flowers and the moths that it attracts. I just found the popcorn plant this year. I have one and it is doing great. At six foot tall with those handsome yellow blooms it calls for the hummingbirds and a few butterflies to stop in. I will look for some seeds of this one. 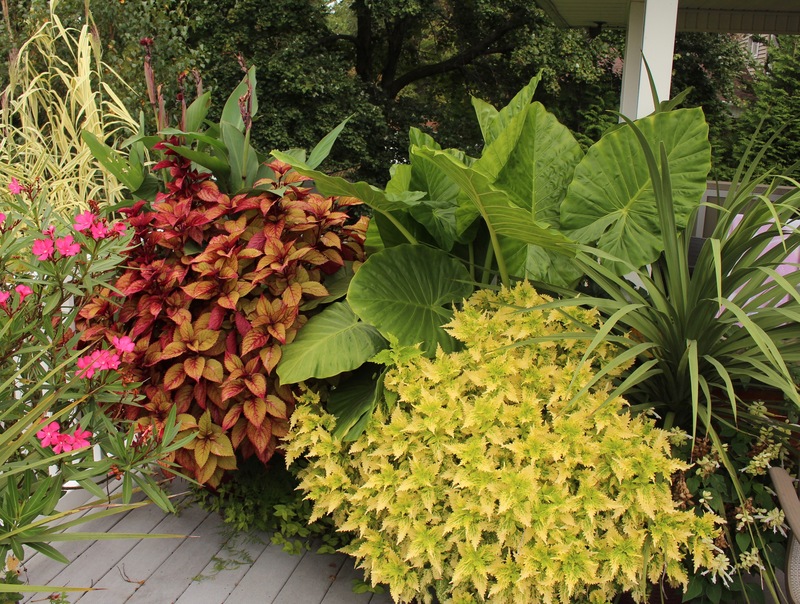 Those sprigs of coleus would encourage anyone to try to winter over some cuttings. Well done. I’ll be agreeing with you in a few more weeks when all the extra stuff picked up over the summer needs to find a winter home… and I find out everything else has doubled in size! I’ve already got a mental chopping block going on. 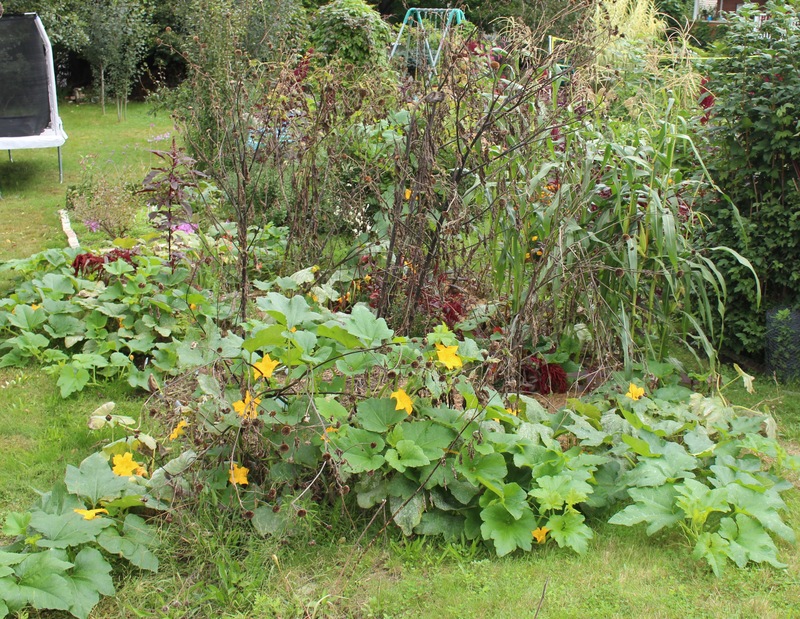 A few things will not be joining us this winter, and several plants might have worn out their welcome. Still it will be a mess. I know on that cold day when I’m dealing with slimy frozen canna stalks I’ll be considering letting all of it go and sticking with just a few houseplants. That day will get here someday. Hope things cool down for you. Here’s it’s a decent temperature but eternal fog and clouds. I can barely tell if it’s noon or 7pm. My favorite fall blooming annual is flowering tobacco. Cosmos is pretty good, too, but only until the first frost. And that cringe-worthy color combo is called “tropical” by a lot of people, and then it’s okay. hah. “Tropical” is an excellent response to any color complaints I get. I managed to lose (aka killed) nearly all my flowering tobacco seedlings. A few came back on their own but I did want a couple of the tall white ones. I bet if I just threw the seeds around in May I would have been much more successful. Holy Toledo! Those deck pots are fabulous. That’s what your warm summers provide. The cuphea is one to repeat for sure. I only plant annuals in pots (other than tulips which I consider annuals and I plant a few into beds). 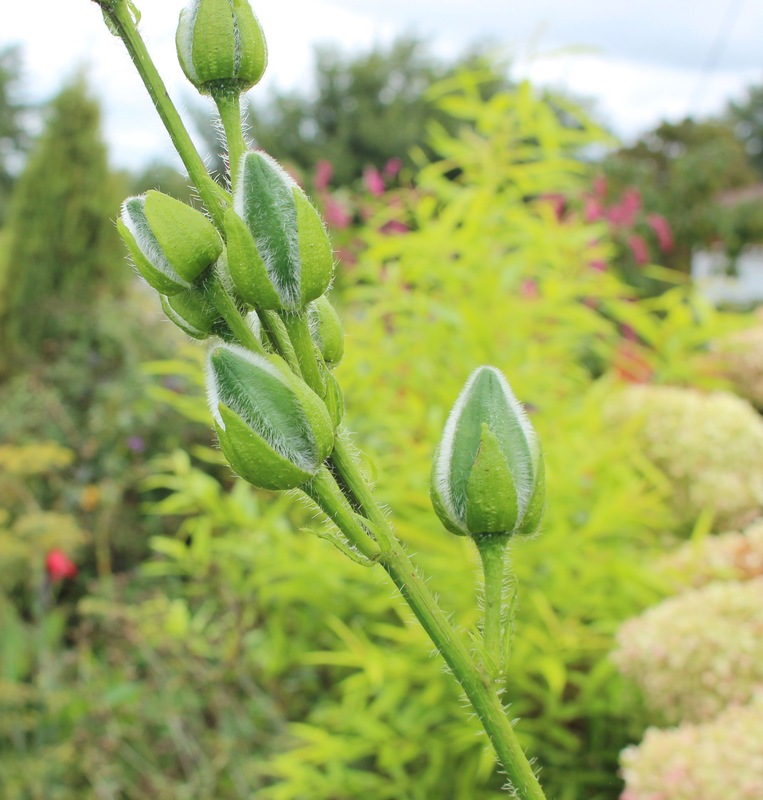 You have such a range of textures in your annuals there, and you’ve inspired me to up my game next year. Stunning! Seriously? I’ve always admired your deck containers and wondered why I couldn’t get mine to look more like that!! Funny, isn’t it? I suppose we just get used to looking at our own stuff all the time that sometimes you get a little tired with it. Every spring I have to remind myself to not always get the same exact thing. Someday soon I’ll be cutting back on the annuals I’m sure. Two years of decent rains have spoiled me, and usually I get so sick of watering that the container ones are the only ones which make it to October. Oh you really have to look into a drip irrigation system. It sounds a lot more complicated than it is, it’s just a matter of running a few hoses and putting in some drip emitters, and getting a timer to go with it. I’m going to try an do a post on it this winter when we have more time to think of those things. The only problem would be sore fingers from all the fiddly small part work. Your garden looks superb. I have had annuals in glasses on the kitchen windowsill but usually ditch them in February because I can’t take the clutter and I don’t have grow lights anyway. But I can clearly see your point since everywhere in your garden it looks lush and summery. We are still in rain mode. Most weeks we are getting rain on at least 4 our of 7 days. Currently at almost 4 inches for Oct. And cool temps. So it looks like autumn may be over here, esp. as frost is predicted in a couple of days. A very frustrating gardening year weather wise. Don’t be too impressed by the lush and summery look. It fades fast once the nighttime temperatures begin to drop, as they are now. Just a week later and the coleus are dropping leaves while the asters are winding down. All of a sudden I’m grateful for chrysanthemums and winter greenery! The hellebores are starting to look nice and lush! It was a very weird year. We didn’t have the drought part but instead had endless rains. Maybe once in August I considered watering new transplants, but then a day or two later it again rained, and I think that was the longest dry spell we had. Humidity was all over the place as well. I’m not a fan… and the bugs… ugh. The coleus make for some fabulous autumn colour. 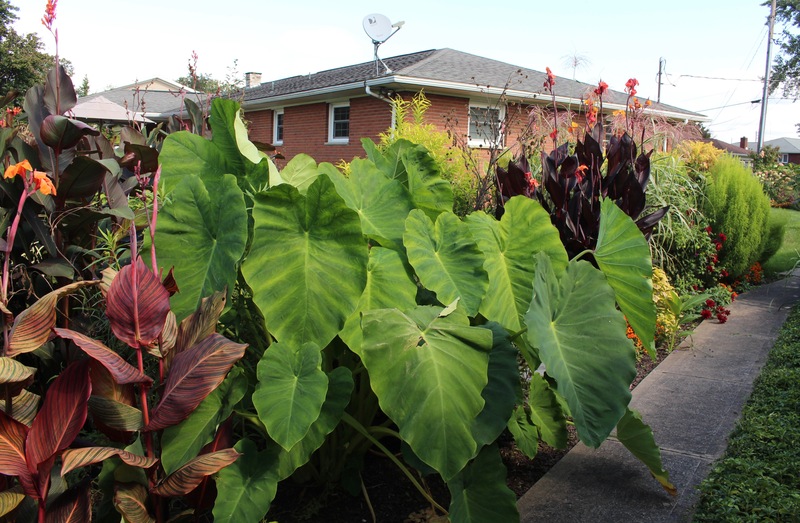 Love those enormous elephant’s ears – amazing how yoir tropical garden is still so lush and, well, tropical! 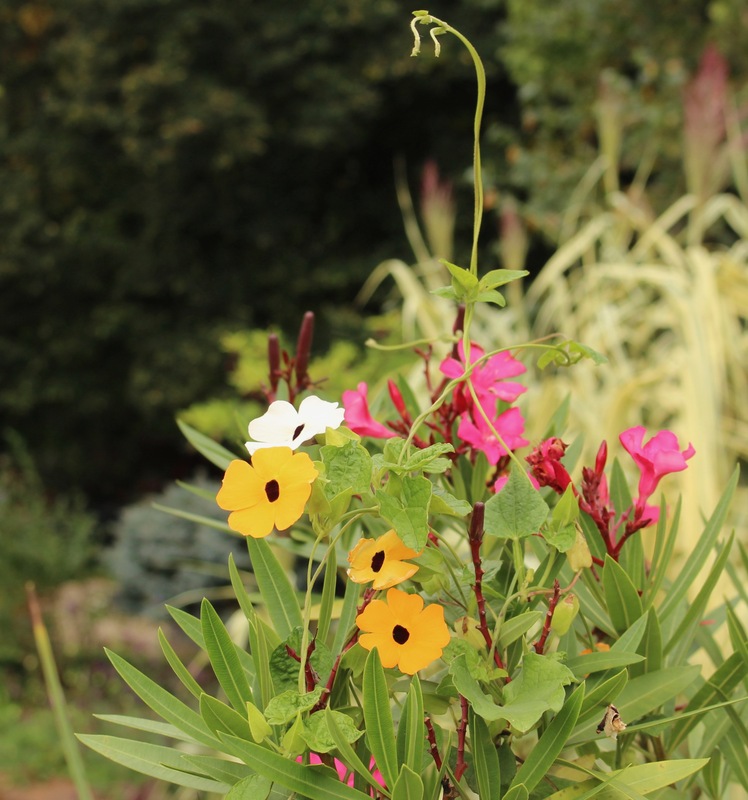 The Browallia is new to me – I do öike blue flowers in summer but they are not easy to find. 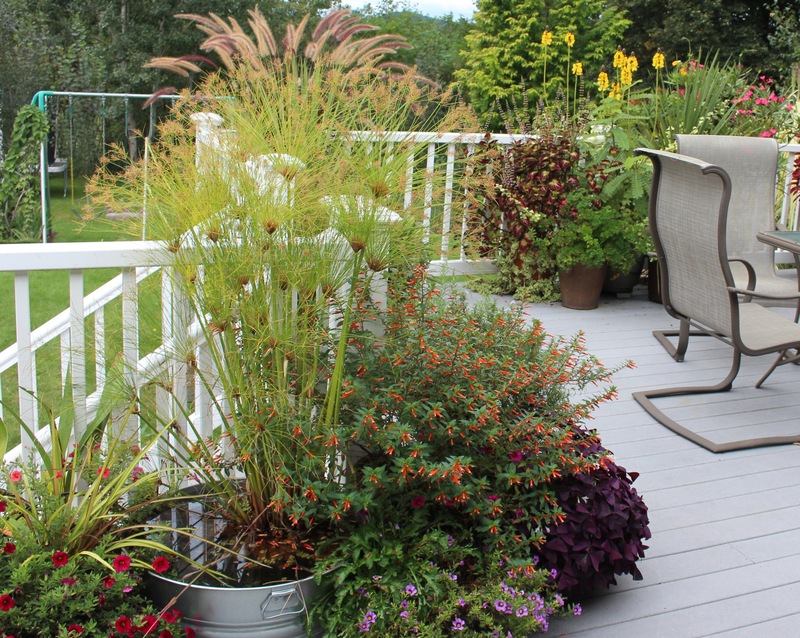 Your garden and deck are looking great Frank, despite the onset of autumn! Thanks Cathy! I’m going to miss it in a few weeks, but to be honest I’m ready to move on. Something about the cooler weather makes me want to start tidying up and thinking about next spring! I love Cuphea. Tried Browalia but the birds just tore it to pieces. 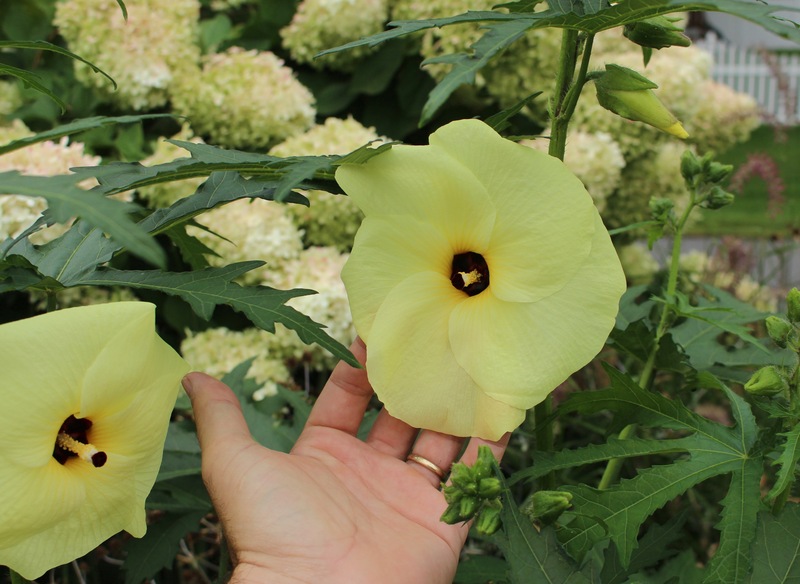 Your Abelmoschus at first glance looks like a Hollyhock, which is a good thing. Might give that a try. Your garden is looking great. 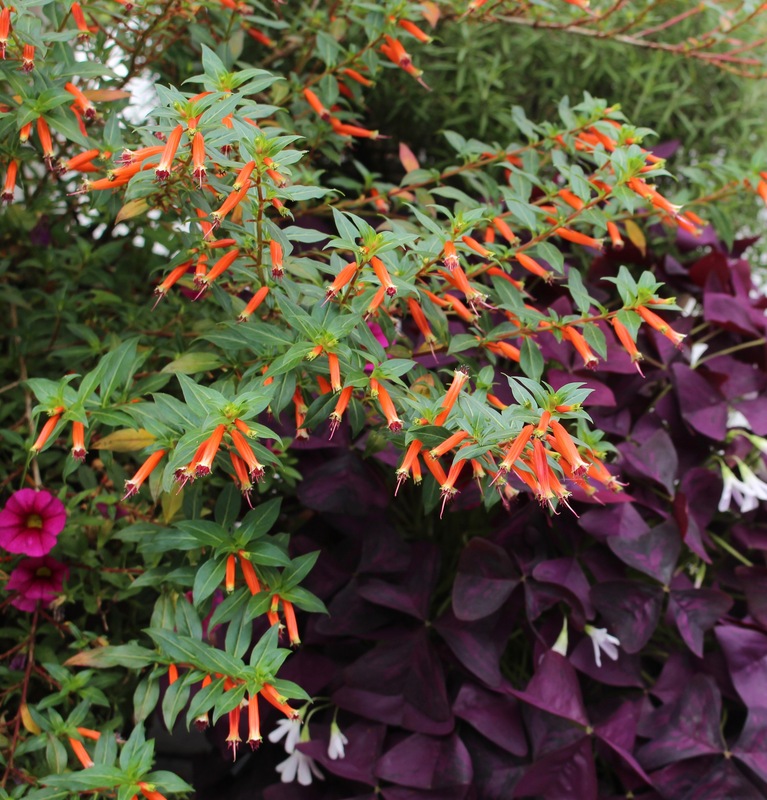 I think you’re the first one I saw growing the cuphea, I’d seen it in garden centers but never took the leap until you spoke well of them in your container reviews. Well you have some very upmarket annuals. 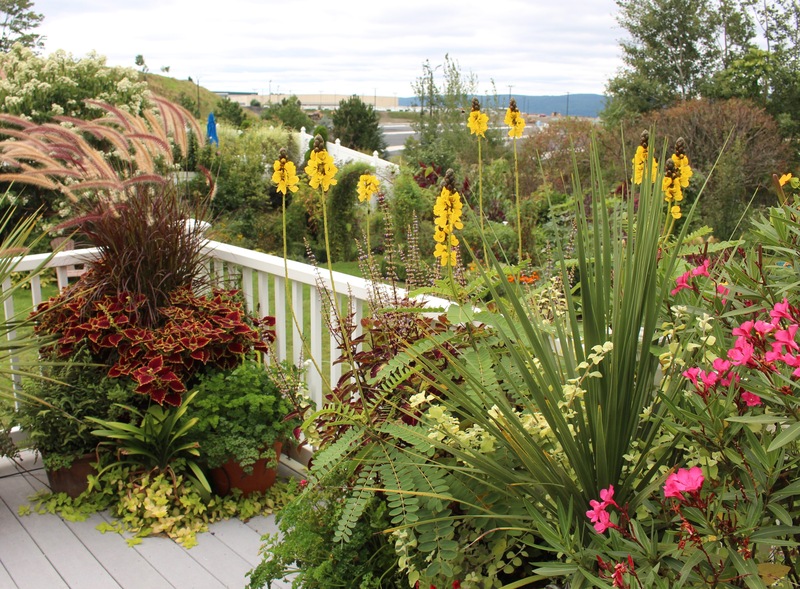 Your late summer/autumn garden is fabulous. I love those calidiums. 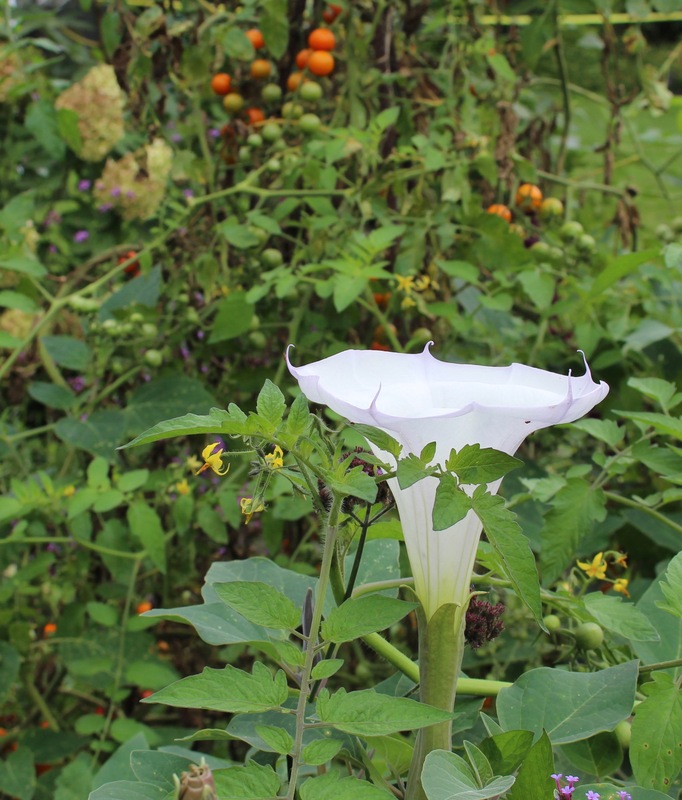 We all grow poisonous plants, datura, ricinus, oleanders- all deadly. So are many other plants. But then who snacks on their flowers? Great color combination in that Coleus, zinnias, salvia and Abelmoschatus. Actually all the plantings are wonderful. 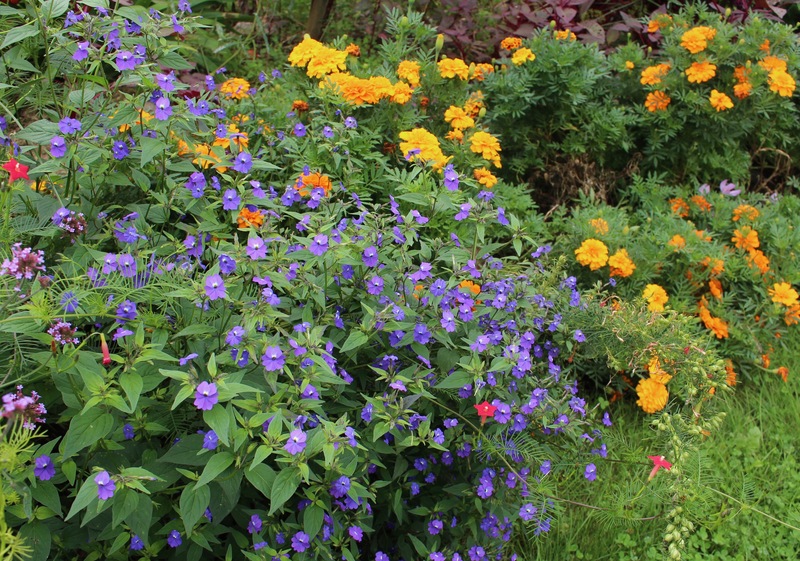 Lots of great annuals in your garden. I love them for their color and all-season bloom. Your garden always looks fabulous!